Editorials from Theslowlane: Brain drain worry. Keeping up with peer institutions make college less affordable. Brain drain worry. Keeping up with peer institutions make college less affordable. My earlier post is about memories of an era when college was more affordable. Many people are wondering what happened. Why is college so much more expensive these days? Lots of theories, I guess. I think a big part of the problem is another manifestation of growing income disparity. So many jobs that are low wage compared to the higher paid professional jobs. I remember a period, in the 1980s and 1990s, when there was quite a bit of worry that faculty pay at universities was falling behind pay in other states and other types of business. There were attempts to boost pay scales for the sake of talent retention. 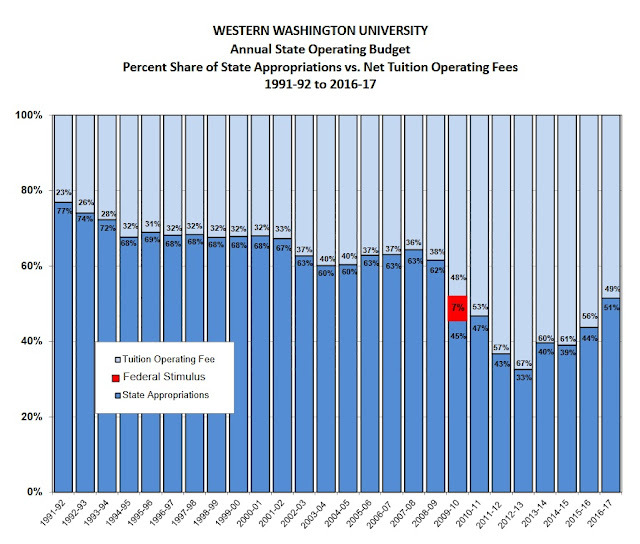 This added to the cost of running the school and, at the same time, the states were basically lowering the percentage they paid for the cost of running state colleges. Tuition had to carry a higher percentage. Even though, I guess, total numbers are higher now, percentages are different. When I was in school, I think a full 70% of cost for running the college came from the state. Now it's more like only 40%. More total money from the state, than before, but lower percentage which makes a big difference. Also it seems like the split within universities is more pronounced with college presidents and top administrators making a lot more while entry level and adjunct faculty barely get by. Mounting costs for certain things, like healthcare and housing, add to this problem making living expenses for students more expensive while rising healthcare costs eat into state budgets; part of the reason why today's percentages are different in state budgets. The growing income gaps are not serving us well. Below is a chart I found in a PDF file from WWU. It shows decline in percent of budget from state quite well. This isn't taking into account the figures for money from grants, Western Foundation and so forth. If that was figured in I don't know. Maybe less than 40%? It does look like the percentage from the state is making a comeback in most recent years.